A Rephotographic Survey of the American West. Project directed by Mark Klett. Museum Of New Mexico Press, Santa Fe, 2004. 256 pp., 138 duotones and 14 color illustrations, interactive DVD, 11½x8¾". Signed by Mark Klett and Byron Wolfe. In the nineteenth century, American western landscapes were first photographed for the geological and geographical surveys. 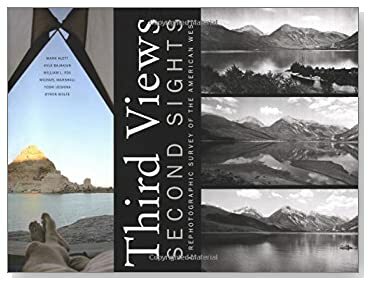 Third Views, Second Sights presents forty-three photographs taken from a third survey, pairing them with both the original 19th-century landscape survey images of the West, and rephotographs taken in the 1970s. Note: Discounted copy is signed by Mark Klett and is a remaindered copy in Fine condition with Near Fine dust jacket (closed tear at crown of spine, moderate surface wear).